The third annual Battle of the Allstars is happening THIS Saturday, 2/9, at a new location, and 30 of your favorite local food trucks are battling it out for bragging rights as the grand champion….and YOU get to choose the winner! This year’s event is taking place at Regency Square Mall directly in front of the JSO substation from 11-4pm, and with this lineup of trucks is sure to be a sell out! Get there early and in your stretchy pants, it’s going to be a great day for eating! There will be an expanded kids play zone, local vendors, and more family friendly fun as well! Check out the lineup of trucks below and RSVP on the Jax Food Truck Food Court’s Facebook page for more event details. The Happy Grilled Cheese: Multiple time People’s Choice Winner for best food truck in all four major Jacksonville publications, The Happy Grilled Cheese is one of Jacksonville’s OG heavy hitters! Take it cheesy with their signature Daddy of the Mac and loaded cheese fries. Plus, Pro Tip: you can add mac and cheese to any sandwich if you’re feeling decadent! Our favorite is to add it to the California melt! You’re also not going to want to miss their sweet, decadent, chocolate laden S’more melt! Cuban Fire Grill: Authentic, slow cooked, homemade cuban cuisine featuring Cuban sandwiches, lechon asado, ropa vieja, and flan for dessert. Their steak sandwich is ridiculously good for all the meat lovers out there! We’re also very appreciative that they serve their Cuban sandwiches with potato sticks, it’s such a nice touch! They were recently named best Cuban Food in Jacksonville by Jax Restaurant Reviews readers, so you’ll want to eat here for sure! 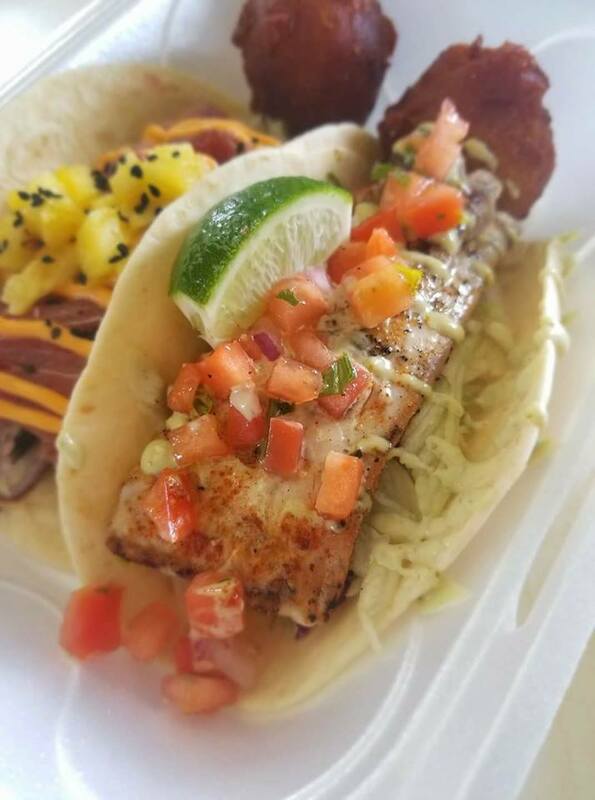 What’s the Catch: Some of the best, most flavorful, and delicious seafood tacos are coming off What’s the Catch food truck. You can find their vintage Airstream at festivals around Jacksonville and beyond, but we are happy to see them as often as possible here in Jax for our taco fix! We can’t do without their ahi tuna. The best part about What’s the Catch is it’s bringing truly local flavors to the locals – most tacos are inspired by what’s freshly available in Jacksonville. Multi-time award winners for Best Taco in events throughout the city, they’re a dream come true for coastal flavors! El Mariachi Loko: This truck is upping the street food game with gourmet Mexican tacos, tostadas, quesadillas, pupusas, and more! You can taste that each element is homemade and prepared with exceptional care. Their specials are mind blowing—think grouper tacos with aioli and black bean salsa, spicy shrimp tacos, or mahi! Whether you’d prefer traditional al pastor or something more out of the box, El Mariachi Loko will have you covered. 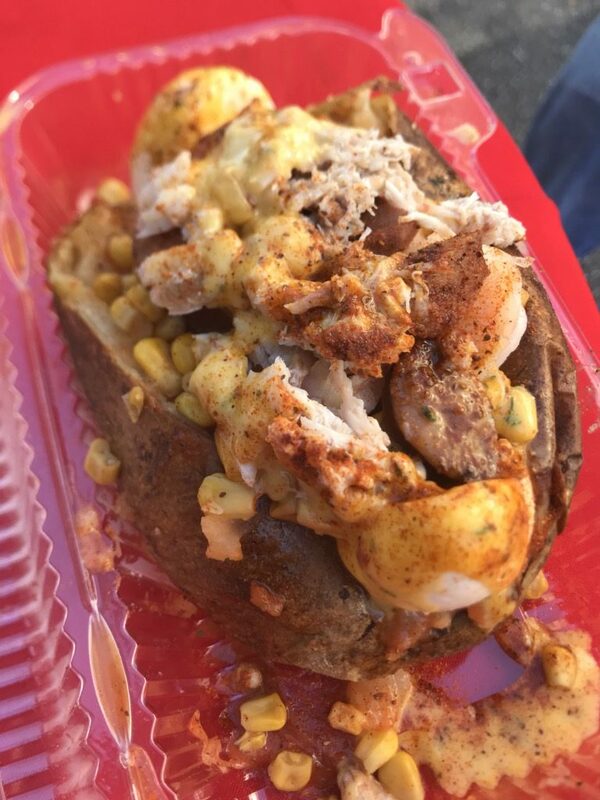 Team Love Seafood: Get your souls ready for this amazing Southern style truck! Specializing in all things comfort food, Team Love Seafood serves up fresh fried or grilled fish, shrimp, fried pickles, hush puppies, gumbo, etouffee and more! They’ve got the flavors of the South on lock, so come out and try the most flavorful fried seafood this side of the Mississippi! Whether you go poboy, deep fried deviled eggs, or pound cake cookies for dessert — you won’t be disappointed! Cajun Cravins 2 Go: Have you been looking for the best cajun food in Jax? This is it! Chef and owner AJ is a Louisiana native who can insert the soul of Creole cooking into any dish! His gumbo, etouffee, red beans & rice, and jambalaya are all spot on authentic and his shrimp or catfish poboys will have you doing a second line dance through the Takeover! Stop by and eat one of everything! Funnel Cake Queen: These aren’t your average funnel cakes people, so buckle up and get ready for the best one of your life! Get your daily serving of fruit with these sweet as pie caramel apple funnel cakes, or try one loaded with chocolate for a richer treat. If you’re a traditionalist, there are sugar coated originals that stand alone as the best in Jax even without toppings! Twisted Okie: Yall ready for some Midwestern BBQ and Tacos? This Oklahoma BBQ will definitely be some of the best you’ve tasted! He’s best known for his signature spare ribs, but his tex mex tacos are also fan favorites. Protip: Look out for his mile high piled sandwiches, in particular the Baker Mayfield special! You’ll want to grab plenty of his delicious homemade sauces too! Latin Soul Grille: This truck’s fusion of Puerto Rican and BBQ makes for an irresistible menu. Their tender, flavorful chicken thigh tacos with fresh pico de gallo and delicious wings are addictions of ours. Their speciality empanadas are made with just as much care! They run amazing specials like the featured Mofongo. If you wanna try it all– go for the Latin Soul Bowl! Plus, we think their customer service is some of the best in town. It’s hard not to fall in love with Latin Soul! Mr Potato Spread: Not a single person on this planet can turn down a massive loaded potato. Mr Potato Spread is fulfilling this great need in Jax with over the top potatoes and loaded fries that will carb load you right into heaven. Want it topped with broccoli and cheese? Go for it. Want it loaded down with meat? They’ve got you covered. Want it covered in CRAB BOIL?! Your dreams have come true. Named Best Food Truck by First Coast News, and multi time winner of Food Truck Championships, Mr Potato Spread is not to be missed! Le Petite Cheri Cupcakery: Who doesn’t love cupcakes? Le Petite Cheri raises the bar with seasonal flavor combinations and fresh toppings. Their desserts are rich and decadent, just how we like them! Also don’t miss their fresh made raspberry lemonade which is the perfect food truck rally treat! They’ve been experimenting with some new treats lately, so check out theri specials boards and don’t miss the newest items! They’ve won countless awards for their amazing cupcakes, so take home one or twelve! Chubby Burrito: One of the most popular Mexican trucks in Jacksonville, Chubby Burrito specializes in authentic Mexican style street food. All food is freshly prepared daily and focuses on simple, authentic flavors. The carne asada street tacos and chicken tinga burritos are can’t miss orders. Oh, and did we mention there are churros?! Multiple time winner of Best Global Tacos, Chubby Burrito satisfies your need for all your Mexican comfort food favorites. Rocco’s Pizza: Feast your eyes on the best New York Style pizzeria on wheels! Aside from mouth watering, cheesy, soul fulfilling pizza they also feature delicious buffalo wings. One owner was a GM in a major chicken restaurant chain before and she brings her talents and experience to making her own unique flavors. Go ahead and get pizza AND wings, you know they’re a match made in heaven! They’ve also got garlic knots and zeppolis to enjoy too! Blazin Azn: Bacon fried rice is all we really need to say, but there is SO much more to love at Blazin Azn. Spring rolls, egg rolls, and incredibly tender teriyaki shrimp and chicken are all worth ordering. Want a real treat? Enjoy the only sushi or sushirito coming off a food truck in Jax with plenty of signature rolls! Chef Gus loves to surprise us with over the top rally specials too, including his multi award winning Tuna Tataco! There’s a fusion of flavors at Blazin Azn so we have faith there is something that everyone will enjoy! Guanabana: This Jax favorite expanded from their iconic tricycle that you’ve grown to love at RAM every week to a full truck and the menu grew right along with it! 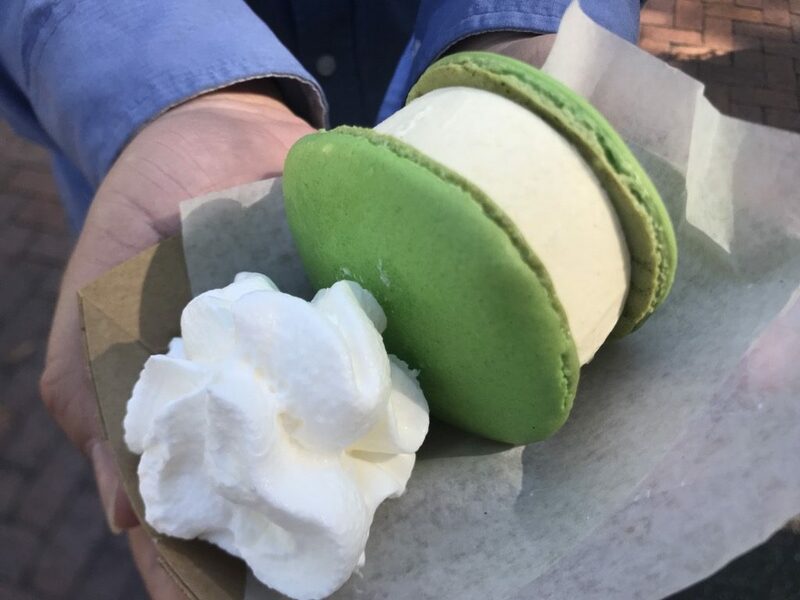 They still integrate their beloved popsicles, but also now offer macaron ice cream sandwiches, fruit bowls, smoothies, and more! If you’re looking for a healthy, delicious, yet indulgent treat this should be on your list! Their multiple award winning dessert is their Meregnon — think of a dessert that’s impossibly light and decadent all at the same time. Front Porch Kettle Corn: Start your food truck Takeover adventure here for an appetizer! Fresh made sweet and savory popcorn, mouth watering spicy pork rinds, and the best southern sweet tea south of the Mason-Dixon line. Made with a secret recipe and very special water, this tea is unparalleled! Take home a few popcorn and pork rind containers to snack on later – you will thank us! There was a reason this popcorn was the featured snack of Jacksonville baseball for several years running–it’s amazing! Kona Ice: Every flavor of shaved ice under the sun plus fresh ice cream equals a crowd pleaser for sure. Kona has become particularly popular with the kids in Jacksonville with their frequent appearances at schools, so expect for them to recognize this brightly colored truck and run to pick out their favorite flavor! Stop by and cool off with the perfect shaved ice! Sweeto Burrito: Always say yes to burritos from SWEETO BURRITO ! 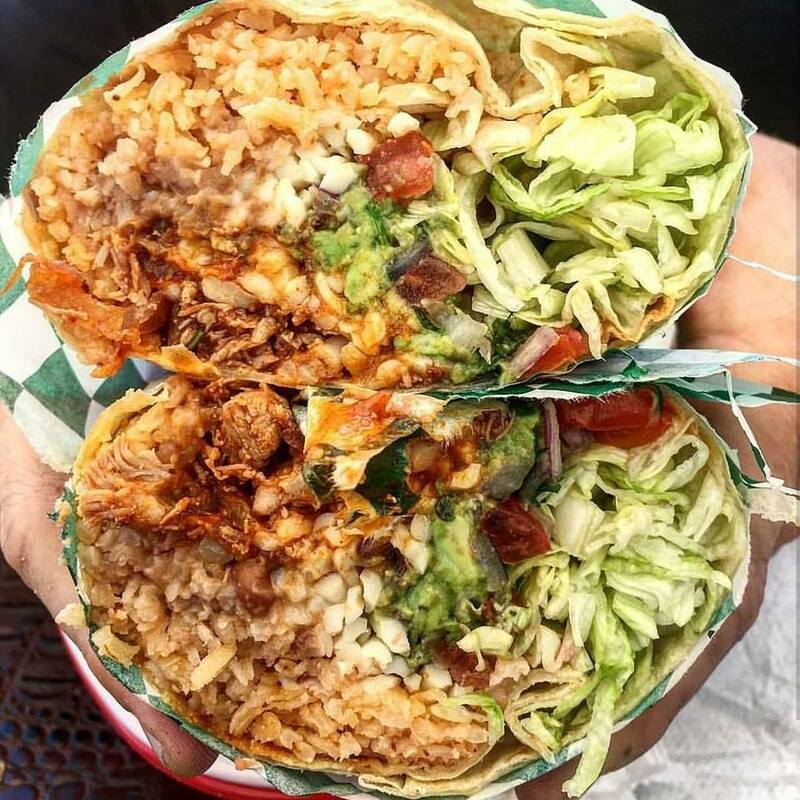 It’s easy to see why Sweeto is one of the most sought after trucks in Jax– their burritos are some of the best in town! Be prepared to share, these are HUGE! The White Chick, Buff Chick, and Rise and Shiner are our personal recommendations! Plus, tater tots in a burrito, need we say more? This is definitely flavor worth fighting for. JammasJax: One of the newer additions to the Jax food truck scene, Jammas is new business of Chef Julio Gonzales who began fan favorite El Mariachi Loko. He’s delved into Asian cuisine now with amazing chicken satay, freshly prepared noodles and rice in his wok you can watch him cook on in the truck window, and flavorful egg rolls and ribs. 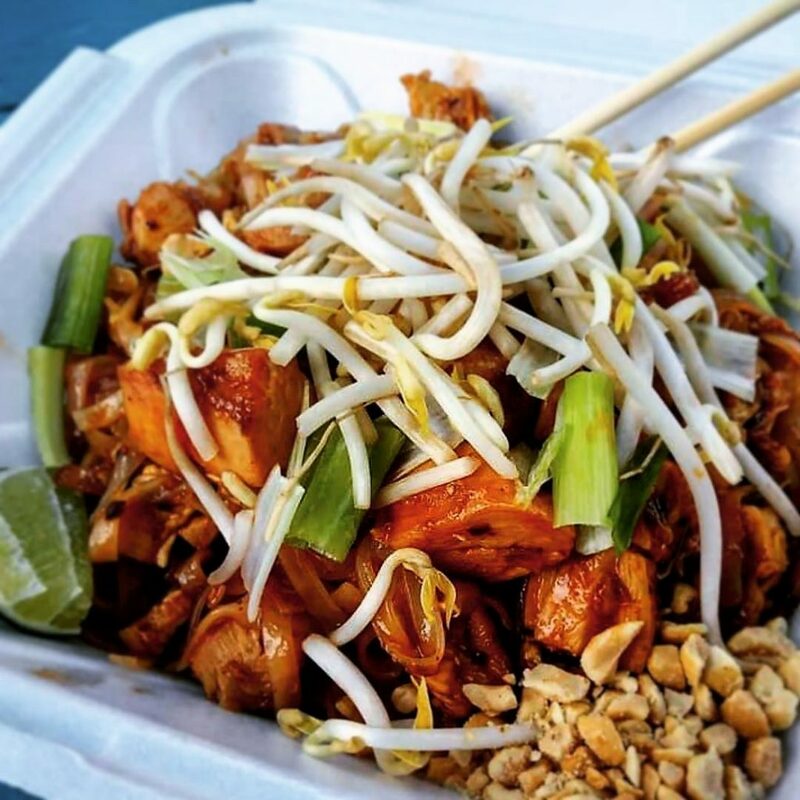 We love his pad thai, and what better to warm you up in chilly weather than curry? This is a truck you won’t want to miss. Wurstbusters: Traditional German cuisine on a food truck? Yes, please! Knockwurst, currywurst, spaetzle, German potato salad, cucumber salad, and more await you from Wurst Busters! We’ve had quite a sampling of their menu and we love their spaetzle covered with grilled onions and their amazing sauerkraut with a currywurst! This is simple German food done right, and we couldn’t be more appreciative that they moved to Jax to serve it! They’ve recently debuted their massive chicken gyro, and it is absolutely a can’t miss item. Treemendous BBQ: Voted Best BBQ in Florida at Food Truck Wars, several time People’s Choice Winner, regularly featured on River City Live and News 4 Jax , and nine year brick and mortar veteran with MULTIPLE food trucks, Treemendous does not mess around with big flavors! Using everyone’s favorite low and slow technique, this truck offers up mouthwatering turkey, pork, ribs, chicken, and more! Who doesn’t love huge portions of smoked to perfection meats with homemade sides?! Cackylacky’s: This truck just keeps on winning awards, and it’s with great reason! They’re fusing gourmet flavors with meaty comfort food and knocking their presentation out of the park every time! Their current fan favorite burger uses a datil key lime aioli with goat cheese and orange marmalade for Florida flavors you can’t beat! Like it spicy? Poblano mayo will kick it up a notch on any burger! Want the best hot dog in town? They’ve got those too! They’re hand pattying their burgers for freshness and authenticity you can’t find many other places. Cackylacky’s goes the extra mile for you, so definitely swing by this truck and see why they say they’ll make your momma happy! Son of a Butcher : A Jax legend, and Jacksonville’s best authentic philly, Son of a Butcher prepares fresh sandwiches, poboys, tacos, and more absolutely loaded with meats and cheeses. Looking for a hearty meal? This is your choice! We cannot get enough of their garlic parm fries. Go ahead and get two orders, you’ll thank us. They’re also known for their secret menu takeover items, so keep an eye out for a delicious taco! Don’t pass up on their healthy option either — their chicken caesar wrap is our favorite in town! Fusion Food Truck : Chef Ashley Amin (winner of top Indian chef in San Diego and best chef in Jacksonville) brings us the best Indian cuisine in the city from her truck, proven by being recently named one of the top 50 food trucks in the United States! They were also named Best Food Truck by First Coast news, multi time Jax Truckie’s Food Truck Champion, and People’s Choice Award winning! 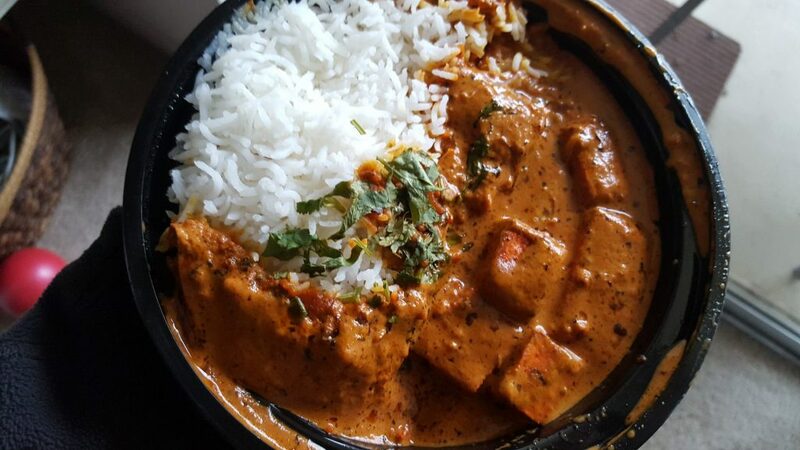 We highly recommend their award winning banana curry and tikka masala paired with a decadent Thai tea. If samosas are on the dessert menu, you’ll definitely want to have one or ten! Really, we love everything on Fusion’s menu, so order liberally. Island Dream Food Truck will be cooling off at our Takeover, will you? ​Florida weather = Italian Ice everyday! Island Dream features creamy and unique Italian ice flavors and lemonades. The flavors change often, but they’re always refreshing and flavorful across the board. We’ve recently fallen head over heels with their Arnold Palmer flavor. Pro tip: their Oreo Funnel Fries are the perfect choice for anyone with a sweet tooth, they are delightful! Back to the Grind: Coffee, milkshakes, smoothies, and more! Back to the Grind is a heavenly choice for your caffeine or sugar fix! They source their coffee from a local roaster exclusively to ensure you’re getting the freshest product every time. They extend those high quality ingredients to their smoothies too, even offering superfood add ins to refresh you and power you throughout the day! They’re one of our new personal favorites, because really, how can you turn down a peanut butter milkshake? Tagged arlington, asian, bbq, burgers, Casual, coffee, Desserts/Ice Cream, Food Truck, fusion, lunch, outdoor dining, regency, Southside, tacos. Bookmark the permalink.